↑ "Cichorium intybus L. synonyms". Tropicos.org. Missouri Botanical Garden. Retrieved 23 March 2014. 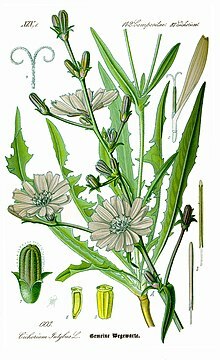 ↑ "Cichorium intybus L.". The Plant List. 2013. Retrieved 23 March 2014. ↑ "Cichorium intybus". FAO - Food and Agriculture Organization of the UN. Retrieved 2013-12-16.